Doerk: I have with me right now Bernd, the founder and, actually, boss of Egosoft. We just have watched the presentation of X4, namely your newest game in the X-Series. Bernd: Yes, so we develop it ever further, but now it's a bit more than just that. We're doing that for almost 20 years now after all. With X: Beyond the frontier, of which I wear a T-Shirt right now, it was actually like little steps forward. What we do right now is basically the connection of the series until X³: Albion Prelude and what we started with X: Rebirth, namely a completely new technology and the try to make space-games more fitting to the mass-market again. It was mainly the new engine and all the development that went into X: Rebirth that we now basically want to fuse with the features and the many possibilities of flying all the ships by yourself and that was and that was a giant task, at least for us. Doerk: Just there you already named one of the key-features: Flying ships by yourself, that’s the part in first-person, so you really are kinda inside. On the other side the strategy-part doesn’t come out too short. Where does the focus lie more? Can you say something to that already? Bernd: No, that is decided by the player. That is actually what X stands for and now there’s really this strategy-aspect that was added, I mean, that too kinda developed over the years. See it like that, in the beginning it was really one ship, one man, you’re flying through space, buy wares, but you do that with your own ship. And then there’s this ability to commandeer many ships, to control many ships, that came later in the X Games and with that it really became more strategic. We never had the interface for that. We had many lists, charts. That didn’t quite make the game any more accessible, and what we did now with X4 is a 3D-map that makes it really easy to remote-control ships. So this strategic part as a contrast to really sitting in your own ship and combine those two aspects. But what kind of game it is exactly, you decide yourself. In the beginning it’s always that first-person part. You always start with that because you have one ship with you sitting inside. And you can always get out personally, climb down a ladder, run across a platform, enter a second ship and that is always this seamless transition that is technically the most sophisticated part that the most work went into. Later, when you have multiple ships, when you build your own stations, when your universe grows, then it grows more and more strategic and you yourself decide then, if it’s a strategy game, or a trade-empire builder or big wars with your own fleets. That really is for everyone personally to decide. Doerk: You just mentioned your 3D-Map, can you perhaps say one or two more sentences to that? Bernd: Yeah, that’s the possibility to basically choose units and give commands to them and to get those visualized immediately. That means you click on your ship, right-click on a station and see immediately what commands are available. “Attack the station” Then you see a line, attack, you have many ships draw a frame, select them, make a group and tell the whole group where it should fly. Or you filter through trading-options, so even the trade became much easier. In the past, especially in the later phase of the game when you did trade with many ships, then X kinda turned a bit into a table analysis. One then often had lists of offers and was seeking for the cheapest, the one with the most profit to make from with one trade. That is now much better because you have this graphical overview of the universe. For example, I have to buy a certain ware, just give me the cheapest prices and then you see it not just as a list, but instead graphical over the universe. And so you can plan your trade-routes like this and see your ships flying around. That was one of the big development-tasks in X4. Doerk: Assuming I’m more of a pilot, I want to fly around, on the other side I also don’t want to pass on building an awesome empire. How much can I delegate to auto-pilots, AI? What do the NPC do? Bernd: Yeah, so they aren’t autopilots, they’re NPC. Every task to others in other ships, to fly, to run stations, that’s what NPC do for you. You have a crew from the beginning and you can always hire people, you also can run every, even small ships, with co-pilots or multiple crew-members. And the further you develop there, the more important it gets. Because as soon as you have a second ship that you want to use at the same time, you naturally need a pilot in there. And when you yourself enter that ship, then the pilot sits in their chair, you click on the stair, the pilot gets up and so you transfer. Very intuitive, and you don’t need a menu for that, but you simply have people who work for you. And these will get more numerous over the time in-game and it gets more significant what kinds of abilities they have. That means the NPC develop skills further the longer they work for you. But only via experience, so to say, training. That means you can’t buy it for money, you really have to unlock for yourself in-game. Doerk: Again a nice feature that is based nicely in the real world ((Not exactly sure how to express that here, sorry)). I really like that. Is the game rather something for newcomers in the world of X games or more for fans of the series? Bernd: Honestly, both. Because that really was our aim with X4, that it’s not just made more complicated, but that we manage to have all those features the fans want, which was the problem with X: Rebirth where many of those features, knowingly, missed and yet keep the game accessible. 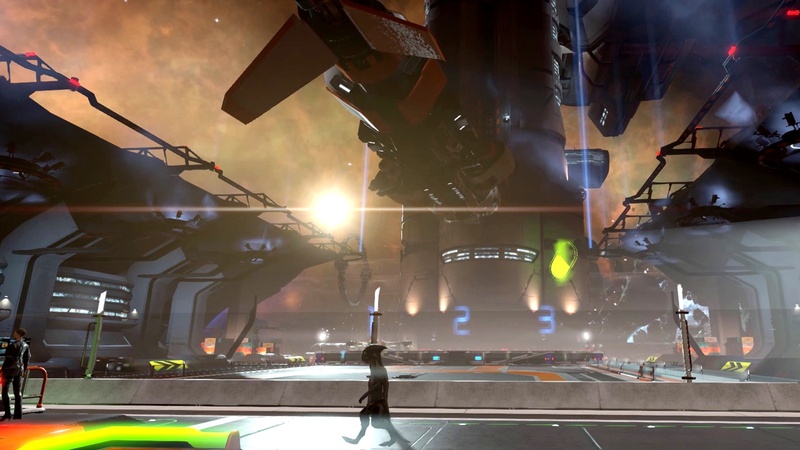 And that is in great parts thanks to that 3D-map that is also decisive for things like stations where you connect modules which is done graphically so you can see immediately how they connect to make the game more intuitively playable. These are things one knows from other PC-games and one doesn’t need to read a long manual first. That actually was always our aim. Doerk: And regarding the backstory, is there much fan-service? Bernd: Yes, of course there’s much we hide in the game, so to say, so that even a new player notices that there’s a lot of history there. The universe has become quite old in the meantime and there’s not just the games that play out in there and the precursors that built a lot of backstory as well as multiple books that were written. And we try a bit to connect those two things. That means the player, also the new player, should notice over the course of the missions, of the game, that there’s more than just this new game, but instead that there’s much past behind it already. The races in the game have a history, there’s also many unsolved mysteries, links to the past and through that you always find things in the game. Doerk: You’re moving, in parts, or with the games mechanics in the same world and were able to build up upon that. In what way is that an advantage regarding bugs or ways to build upon, for example when you look at the last installment of the game? Bernd: Well, so Rebirth, of course, was criticized in the beginning because it really had problems with bugs, and it was criticized by fans who had different expectations of. Who went into the game thinking that it’s already X4. A reason for many problems was, of course, that X: Rebirth did things completely new. The game had to be developed completely from scratch. A completely new engine was developed, not just the graphics-engine, but also the game-engine, the way the missions were programmed, everything was new. For a company like us, even with 7 years of development time X:Rebirth took, it was a gigantic task. Bernd: Yeah, you can say it like that. And now we basically have over 4 years of development time since X:Rebirth and the difference was, that we now had at least a base to go from the beginning. We had a technical base we could build upon. We have, a long time already, a really stable universe. We test, basically…we are in a beta test already for a long time. And this gives me a much better feeling in regards to bugs. Doerk: Do you have your own favorite feature in the game? Are you more of a pilot, or are you more of a strategy kind of person? Bernd: It is really hard to only see one feature with that because there’s always at least a handful of features in the game which are special. One of the features we are very proud of is actually this seamless transition, the feeling to really get up from your chair, climb out of your different ships in different ways, walk through a tunnel to a ship’s bridge, then perhaps land somewhere else and then- simply these seamless transitions from ship to ship in first-person. But there’s so many other cool features: The modular station-builder, the graphical designing of your own stations when you really have the chance to create completely unique stations by yourself. Doerk: Already nice when you like all of it. Do you have the time for yourself to check out other titles of the genre. Thinking of No Man’s Sky or something like that. Do you still want to get to know something like that or are you so lost in your own game because it offers so many, many possibilities? Bernd: Yeah, I have to admit that I try to avoid being distracted all too much by other games of this kind, yes. But No Man’s Sky, I threw a short look into together with my son. If I play myself, then I rather play small indie-games. Of course I look on the competition, often a few youtube-videos, how they look, graphically, how they solved certain problems. It is, of course, interesting from a designer’s point of view. In principle I’m interested, as a gamer, in sandbox games. So regarding that not just in space, more generally games that do not tell me how to play them. And in so far, they’re similar then. Doerk: Now there’s in the real world some stuff you have to adhere to, things like release-dates for example. Do you have announced something like that already? Or already a plan in your head when it should come? Bernd: Yeah, in our heads we do have it concretely, but I can’t say it right now. But we will announce it in the very close future, yeah. I'll proof-read it tomorrow again, when I'm a bit rested. Sorry for mistakes, if I made them! Thanks for the translation. I saw someone posting a link to your translation in the egosoft forums. My translation on the Egosoft-forums? Yikes! -> Else it would make sense for them to post more English interviews/previews/trailers. Could be that they need more time after all. The game will have lots of bugs in the beginning (and a long support afterwards) anyhow. Im looking forward to the ability of the ai to completely reshape and rebuild the economy (not having dedicated station roles as before). That should give some long term economic gameplay. The only thing I dont like from the previews are those silly looking alien models, and a bit too cartoony / plain artstyle chosen this time. That alien just looks stupid, like a character from a kids cartoon. Maybe in the next game they could change the story (Terran sectors cut off from all others previous races, connected to completely new races) to get some new (less silly) aliens into the game. They could keep the XENON however. Damocles wrote: That alien just looks stupid, like a character from a kids cartoon. Have fun trying to get teladi out of the X universe without literally wiping the whole history of the universe, because Teladi are everywhere. So short of some purge you wont get any Teladi free systems in X. And the character you criticise there is a teladi. And they already did the "cut everything off", its X:R.
And its still a mixed bag because all the races are pretty intermixed by that time. So the only way to have a new set of aliens would be to literally throw everything away that happened in the very first game and after. Because after that everyone is mixed. or you start with Paranids as the central race because they are xenophobic enough to stay pure. Also, what is a not silly alien? Tau? Vorlons? Pattern Jugglers? Puppeteers? Regarding the story: thats about the least interesting part of the X-Games if find. Especially as the Teladi and Boron where displayed so silly and cartoonish. That was ok for the very first game (limited resources back then) but annoyed me already in X2. For me, the races where mainly a vehicle to allow different styles in ship and station designs. I dont enjoy when otherwise more serious games to implement that "funny" part. If you look at EvE and also Star Citizen, they kept displaying cartoonish aliens (Jar Jar like) out of the game. Something people obviously enjoy too. The other route would be going the way No Man Sky went. There silly aliens fit way better into the overall design. Mass Effect introduced great aliens. But that would be too much to pull off in a smaller space sim game. There are always story twists possible to make the transition to other locations in the universe. Like a Terran expedition, stuck in some other part of the universe. People dont all have to like the same things. X seems to go as strong as it's been for the last 20 years. EvE also has no actual aliens at all to my knowledge, just various splinters of humanity. Oh please! A planet spanning, gravity manipulating organism that spontaneously formed before gravitational stresses churned up the planet on its next orbit again? Its actually easier to control than I have though (with some practice). However, this is atmospheric flight, with aerodynamic drag. is that available in a non shady link version as well? #X4Foundations release date announcement, trailer video and gameplay explanation video all coming on Monday 12:00 CEST.